I knew it was only a matter of time. Lincoln's turning four this week. He decided that he wanted to spend his birthday with a couple of stitches in his chin. The funny thing is, we weren't even up to anything daring or adventurous. It was a random Thursday morning, riddled with fussing about how many raisins were in his bowl and whether or not Addie could look at the same book as him. My mom had run by for a few minutes so that I could take a shower in peace, and I was on the phone with our internet service provider trying to determine why we had had no access. The kids were running around (because they always are) and suddenly Lincoln tripped while traveling between the living room and the kitchen. I'm not even sure what he hit his chin on, because there were no toys in his direct path and nothing obvious that could have caused an injury. But when he stood up and began to let out some agonized wailing, it was clear he had hurt himself. On closer inspection, we found that he had split open his chin. He's a tough kid. The bleeding stopped pretty quickly and he was pleading with me to not go to the hospital and not call Daddy to tell him that he was hurt. But the wound was gaping a little too much for my comfort, so I did indeed let Andrew know what was going on so that he could come home from work. 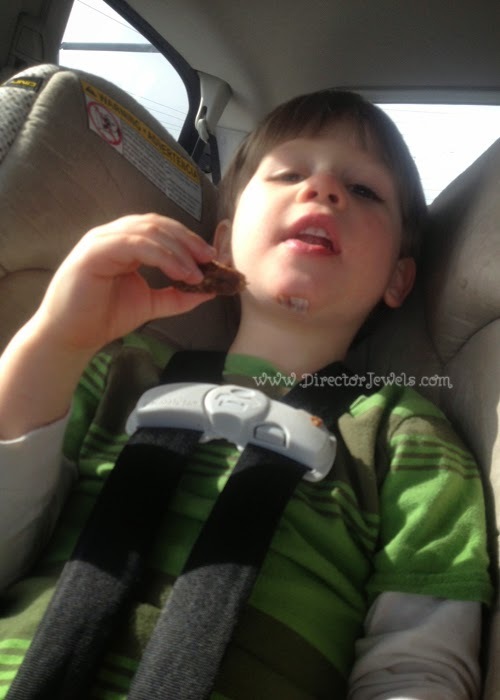 We ended up going to urgent care, where we had a somewhat traumatic fifteen minutes that ended with a little bit of hysteria, a heightened appreciation for strong nurses, a honey stick snack, and two sutures in Lincoln's chin. Thankfully, he seems to have pushed the entire ordeal far from his mind. I think it will stay with me a whole lot longer, though. I was surprisingly less freaked out than I expected to be over the whole ordeal. It was more of a take a deep breath...this is what you are dealing with today kind of thing. 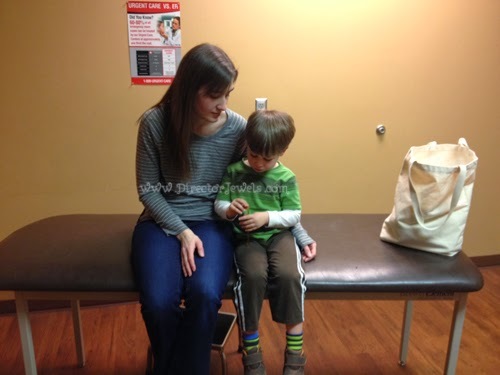 My calm may have been partially due to the fact that he was acting totally normal within a few minutes of his injury. His coffee burn at age two was far more traumatic for all of us! I had five stitches in my eyebrow when I was in Kindergarten. I remember that day very vividly - it's one of my first memories from childhood, actually. I wonder if Lincoln will remember this day? I hope he thinks more about the new Octonauts "Octo-Saw" toy that came home with us from Target after the incident than the actual urgent care visit! I'm hoping for a super low-key week leading up to the big age 4! I'm not sure I can handle much more "excitement." He was a trooper, very brave little guy.I remember him saying "It will heal on it's own Bun"!! I love that little Sugar!! Is there a party that is supposed to be on my calendar that I am missing? Yes! I sent you a text. So behind on planning this year.